As part of Syracuse University’s ongoing commitment to helping its students translate their college education into career and life success, the University has announced an institutional collaboration aimed at reviewing and enhancing its career services operations. The University has announced it will review and enhance its career services operations. Leading the effort are the Divisions of Academic Affairs and Student Affairs, both of which will partner with leadership in the University’s 11 schools and colleges, as well as the central Career Services Office. Guided by the University’s Academic Strategic Plan, the review seeks to strengthen students’ preparation for future success and the transition from college to career. After a thorough review by representatives from Academic Affairs, Student Affairs, schools and colleges, the University has hired a leading higher education expert, TruMann Consulting Group, to assist with the assessment of career services. TruMann will be on campus in late February to begin the review and will meet with various students, faculty and staff throughout the spring semester. 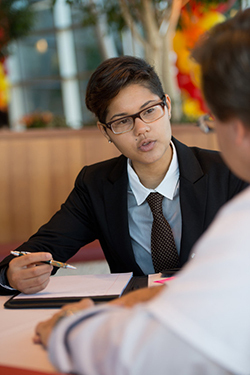 Students have access to a variety of career services, many of which are provided by their respective schools and colleges, as well as the central Career Services Office. Those services include but are not limited to identifying internship and employment opportunities; preparing for interviews; crafting cover letters and resumes; applying to graduate programs including law, medical and business school; and connecting with alumni in relevant fields and industries.